Lebanese corrugated packaging manufacturer, Unipak, is taking steps for its plant to become more environmentally-friendly. A manufacturer can begin its journey to becoming green in many different ways. Small steps range from using energy efficient halogen lights to implementing recycling throughout the plant. Unipak, in Halat, Lebanon, takes steps at implementing eco-friendly initiatives inside its offices, in compliance with the INDEVCO Paper Containers (IPC) green strategy, leading the way among all IPC affiliates. Recycling is the way to go when aiming to take quick and effective action. Manufacturers can implement simple and effective steps to recycle and become more eco-friendly at various levels, such as production and operations. Manufacturers should re-evaluate operations, processes, and products to pinpoint unnecessary waste, whether emissions or excess use of resources. Identifying problem points makes it easier to tackle the larger task ahead. At the production level, the manufacturer can recycle production wastes and produce recyclable end-products. 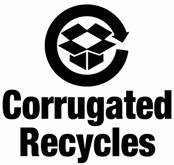 Unipak, for example, recycles all production-related wastes and produces recyclable corrugated packaging. As customers recycle or compost these products, all parties tackle the environmental issues together. At the operational level, manufacturers can promote recycling within the plant by placing recycling bins for employee usage. Unipak initiated a non-production-related solid waste sorting project by placing four large containers in the cafeteria, categorized for aluminum cans, contaminated tissues, nylon bags, and general waste. This waste is transfered to three larger containers, classified as plastic bags, tissue paper, and metal cans before forwarding to a respective recycling site. Furthermore, Unipak dispersed specialized trays throughout the company to collect office paper waste, which is routinely collected and forwarded to sister-company, Unipak Tissue Mill (UTM), for recycling. 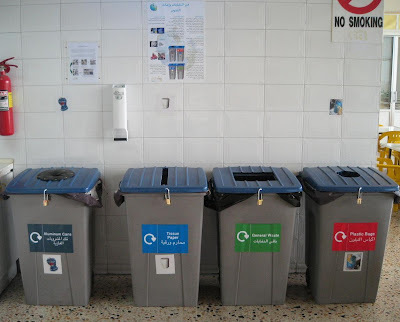 UTM weighs the waste and informs Unipak. 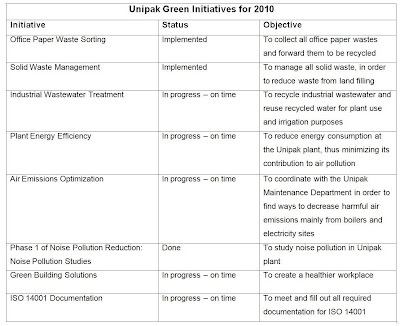 This enables Unipak to measure its monthly paper usage and evaluate whether its initiative to reduce paper waste is effective. Unipak employees decrease paper use by printing on both sides of a papersheet. Recycling trays inside the plant create a ‘think green’ internal mentality that spills into the lives of the employees. To ensure the effectiveness of green initiatives, manufacturers should train employees, in order to increase environmental awareness and explain how to adhere to new green projects. Unipak has held employee awareness sessions to promote reduction of paper, energy and water waste at home and in the plant. Even the smallest efforts to move towards green manufacturing, significantly affects and spreads the green mindset to employees and their families, as well as to customers. How can we all make a difference? 1. Use a washable mug, as an environmentally-friendly alternative to non-biodegradable styrofoam or plastic cups. 2. Leave a cup and reusable bottle for water at work to eliminate buying drinks served in plastic cups or bottled water. 80% of plastic bottles are recyclable, but only 20% are actually recycled. 3. Save water by simply not letting the tap run. 4. Default your printer option to use both sides of the paper, in case a paper copy is needed. 5. Switch off all lights and unplug electrical appliances and chargers since, they continue to consume when plugged in. 6. Lower your office’s carbon footprint by switching computers, monitors, printers, copiers, speakers and other business equipment to their energy saving feature. Turn them off at the end of the day. Unipak is a member of INDEVCO Paper Containers, a division of INDEVCO Group, the ‘Local Multinational of the Middle East’.